FRA is a sponsor of the first Nordic Business Ethics Survey – a pioneering effort to provide insight on employee perception of workplace ethics in the Nordics. After working with Kantar TNS to collect 1,500 responses from Finland, Sweden and Norway, the survey report was released at separate events in Helsinki, Stockholm and Oslo in April 2019. Despite international perception of the Nordic countries as well-governed with low levels of corruption, the Survey revealed that many respondents felt they were insufficiently trained in identifying and reacting to unethical behaviour or situations in the workplace. FRA is proud to support the team of experts behind the Survey in their mission to better understand this reality and help businesses be proactive in raising the bar for ethical leadership and organizational culture. The ethical standards established by an organization. In each area, the business ethics professionals leading the Survey have proposed practical steps for improvement. One key finding was that top and line managers were found to have a more positive view of ethical practices than non-managerial employees, suggesting that more should be done to encourage transparent dialogue. There is also a gap between the number of respondents who say they know how to react to illegal or unethical behaviour, versus the number who actually intervened. Furthermore, the most common reason cited for respondents compromising ethical standards was following managers’ instructions. Assuring employees that reports can be made safely and confidentially, such as through whistleblowing hotlines, is crucial in building an ethical organizational culture. Publishing ethics codes and policies is not enough if employees are not aware of it. The Survey found that only 26% of employees receive regular training about ethical workplace behaviour, and only 9% said that their companies factored ethical behaviour into the organization’s incentive structures. 33% did not know if unethical behaviour is disciplined in their organization. Managers and employees must be given opportunities for training and dialogue, which in turn will increase confidence and awareness of what kind of behaviour should be reported. 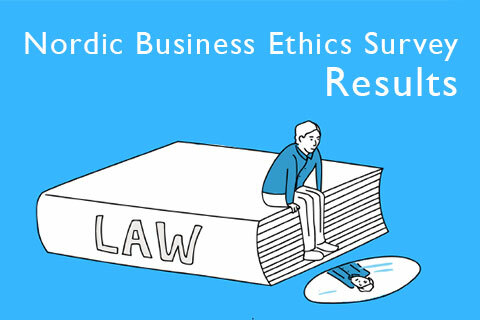 The Nordic Business Ethics Survey is an initiative created by the Nordic Business Ethics Network, a professional network for individuals who share a mission to promote responsible corporate conduct and integrity in our workplaces. Their aim is to conduct this study on a recurring basis and expanding its scope across the Nordic region.